On the Friday before Board of Managers meeting, activist group Mountain Justice (MJ) held a rally to once again call on the board to divest and deliver a previously published letter to the president’s office. The next day, the board announced a new sustainability-motivated carbon charge initiative, but made no public mention of divestment. At 1 p.m. on Friday, around 30 MJ supporters gathered in front of Parrish and waited for activist John Braxton ’70. Braxton wrote the pro-divestment letter that was originally signed by Noam Chomsky and Arlie Hochschild. Since the letter’s publication, Professors Lotte Bailyn ‘51 and Lorene Cary have also signed. 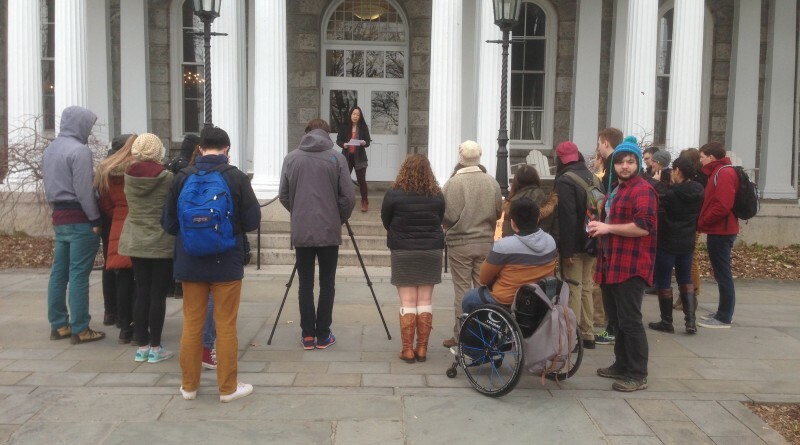 As the group waited for Braxton’s arrival, MJ member Annie Zhao ‘18 spoke. The board has repeatedly refused to divest. Zhao then reiterated MJ’s demand that three board members with ties to the fossil fuel industry recuse themselves from conversations on divestment. When the group first made this demand on January 28, it said that if these board members did not recuse themselves by the next board meeting, MJ would further escalate its campaign. On that same day last month, Samuel Hayes ’57, one of the three board members MJ named, responded that the divestment conversation was over. “There’s nothing more to say,” Hayes said. At Friday’s rally, Professor Lee Smithey gave a short speech supporting divestment and introducing Braxton. As Smithey addressed the crowd, Braxton’s red-coated figure bicycled up Magill walk. Soon, the activist ascended the steps and began his speech. Braxton called for a larger campaign of civil disobedience, recalling his own stint in jail for resisting the draft during the war in Vietnam. “Let the government pay for your lunch for a couple of months,” he said, to chuckles. Following his speech, he led those gathered the president’s office. There, he hand-delivered the letter. Though President Valerie Smith was absent, Presidential Fellow Bruce Easop, who has just come to Swarthmore from Princeton, accepted the letter. “You may have had some forewarning of this,” Braxton said. “Yes,” Easop said cheerfully. Behind Braxton, the assembled MJ supporters laughed. The following day, at the February 20 board meeting, the three board members that MJ named did not publicly recuse themselves from the divestment conversation. MJ member Sophia Zaia ’18 said that their participation in divestment discussions could threaten the integrity of the board’s decision-making. “The failure of these board members to recuse themselves […] leaves us no choice but to take further escalated action,” Zaia said in an email. “We intend to take action that will specifically target the Board members with conflicts of interest,” she added. After their meeting, the board announced a carbon tax initiative, which involves an internal tax on carbon consumption. Zaia said the initiative was a step in the right direction, but added that more drastic action was necessary. “[E]fforts that are confined to Swarthmore’s campus do not address the unprecedented urgency of the climate crisis,” she said. 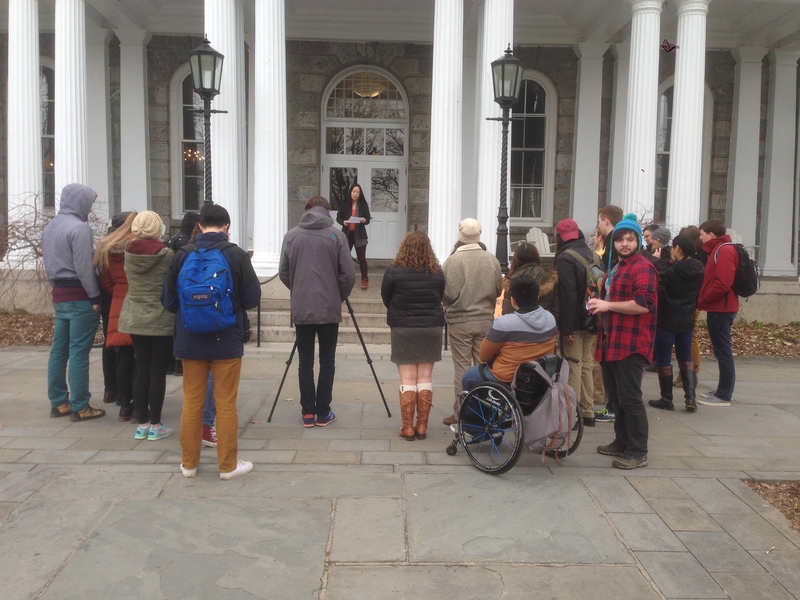 Featured image: Annie Zhao ’18 addresses a group of divestment supporters. Photo by Eduard Saakashvili ’17/The Daily Gazette.